Many years ago this is where I spent an embarrassing amount of time, talking to my friends on the phone. 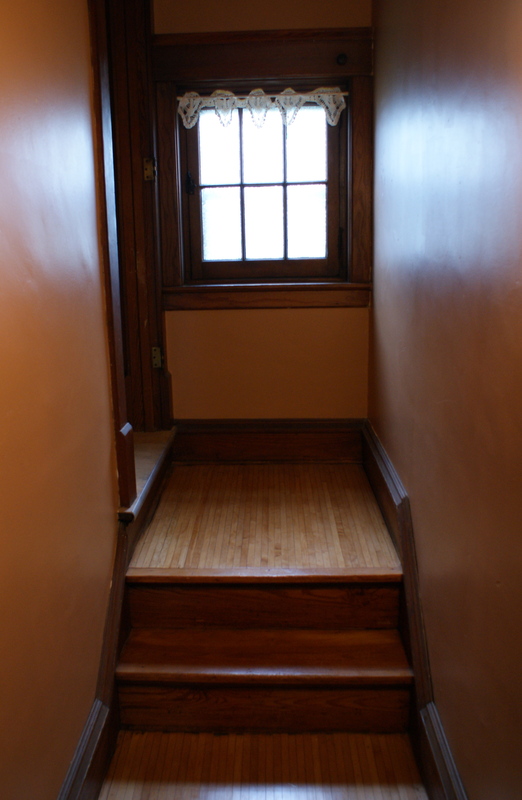 I pulled the mod white trimline phone out of my sister’s room just out of sight on the right and sat on these stairs my back to the wall and my foot on the door trim at the left – that door led to our third floor where there were more bedrooms and the eaves where we hid and concocted secret clubs with arcane rules that lasted a week, if that. Through that door and up the stairs I was a little girl, and in 1974 I moved downstairs and around the corner from this spot and became first a teeny bopper and then a teenager, talking on that phone pretty much the entire time. I talked to the same three or four people over and over – to my best friend who lived a block away, my first boyfriend who lived three blocks down the street, or a few friends across town. I’d be hard pressed to recount anything we talked about, but I remember laughing until I cried, learning to interpret or impose stony silence, and what it meant to hang up on someone. I remember willing that phone to ring, its cord stretched out into the hall, and the receiver cord so distended it hardly curled anymore. They boy friendishness consisted of one kiss, maybe two, but then hours and hours of time on that phone long after we broke up. He remains one of the best friends who is a boy I have ever had; he set a standard for good and witty conversation by which all who followed have been measured. So none of those moments are captured on the web like the hilarious banter I see between my kids and their friends on Facebook; I am glad they allow me to eavesdrop on their exchanges and see them delight in their own cleverness. Since I don’t have a history archived on the web, this photo will just have to do.